Constructive criticism, feedback – every company needs it. It’s a great way to learn, grow, and improve your business. An awesome, but often feared, means of obtaining that kind of helpful feedback is through online reviews. Instead of being afraid of how online reviews might effect business, it’s time for your team to embrace them. 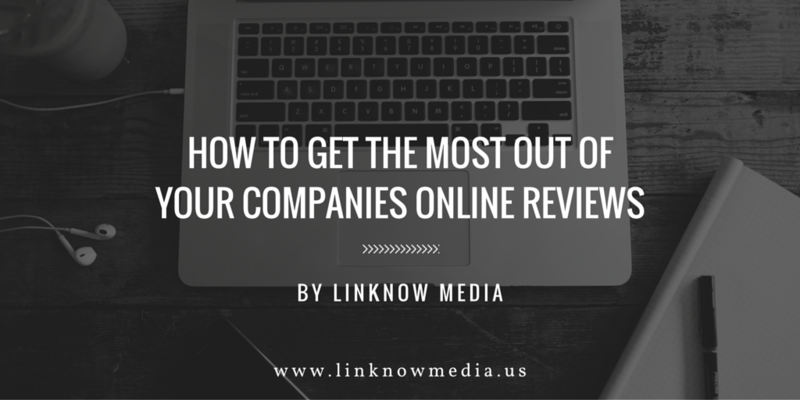 Here are several ways you can actually get the most out of your online reviews. 1. Don’t fear the negative review. A lot of people stay away from online reviews simply because they are scared of receiving a bad review. But the truth of the matter is that most online reviews tend to be positive, not negative. And if you are confident you are offering a good product, there’s really nothing you should be afraid of. But realistically all businesses will have to accept this fact: you will eventually receive a bad review. And that’s okay. In fact, 68% of consumers trust reviews more when they a mix of both good and bad ratings. The trick is to get as many reviews as possible. Consumers are smarter than marketers often give them credit for. When consumers see a good amount of positive reviews versus one or two negative reviews, they can discern whether those bad reviews were fake or simply isolated situations that don’t reflect what their experience would most likely be like. 2. Make your reviews and your review form easily accessible. Tests show that brands using online reviews increase their sales as much as 58%, and that 71% of customers are more confident in making purchases after reading those reviews. Making your reviews visible to your customers shows that you are a trustworthy company that has nothing to hide. Moreover, by making the review form easily available to customers, you are showing you truly value their opinion and want more of it. Companies that demonstrate they are committed to improving usually have more trusting, loyal customers. 3. Don’t just address bad reviews, incorporate them into operations. When and if you get a negative review, embrace it! You should know that it’s important not to ignore bad reviews; they’re an invaluable opportunity to showcase how caring and responsive your company is. But don’t stop there. After you contact the customer who left the bad review and genuinely try to solve the problem he or she encountered, make sure you address the root of the problem internally. While hearing something negative about your business might feel like a bad thing at the time, you are actually being given the chance to better understand the strengths and weaknesses of your business and, most importantly, improve upon them. Research has shown that 95% of customers continue to do business with a brand they once criticized if issues are handled quickly and competently, but the best business practice would be to avoid the issue in the first place because ultimately what customers really want is hassle free service. Improving upon your products, services, and customer support based on customer feedback will organically improve your sales and ROI. If you do a good job at responding to these issues, you will not only win back once unhappy customers, you will also gain more customers who witness and respect your excellent customer satisfaction skills. Success doesn’t come from getting everything right the first time. It is cultivated from being able to respond appropriately to problems, find resolutions, and adapt formal changes to prevent them from reoccurring in the future. Successful companies make the most out of every situation, good and bad. Online reviews are no different.